Japan, 1994 Colour – 119 min. Written and directed by Takahata Isao, from a concept by Miyazaki Hayao, Pom Poko is one of the works brought to light by the Studio Ghibli which is most based on environmental issues and sustainable development. This theme has provided a background for many stories, signed by Takahata and Miyazaki, since Nausicäa of the Valley of the Wind (1984) to Princess Mononoke (1997). 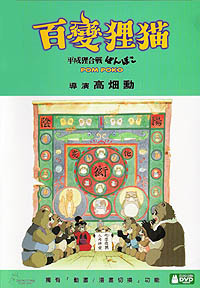 Pom Poko is different form the other cited works because is does not present human protagonists, although the tanuki may also assume human form. 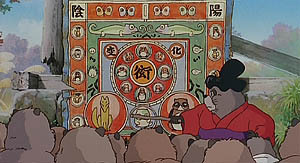 Actually, and consistently with a main aspect in the narrative — metamorphosis at the service of the struggle against progress —, the tanuki may assume three different forms (regardless of the transformation into other beings or objects), according to their disposition or to the action in the film. With their habitat systematically reduced, the tanuki fight among themselves until the real enemy is pointed out to them: Man. The two-feet form, which they assume usually far from the human eye, is that of the typically anthropomorphic animals in children's animation. Whenever there is interaction with their enemies, they appear in a realistic representation. And there is still room for a cartoon-like look, based on a mangaka much admired by Miyazaki, Sugiura Shigeru. Transmutation and television are part of the training to face the humans. Studio Ghibli, as it has been often noted, does not produce art house works, something obvious for any attending observer with the exception of those who include in such denomination any film not spoken in English. 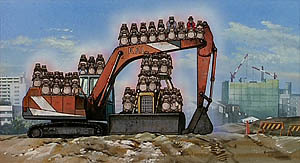 The tanuki anthropomorphic design is used in most of the film and it is the one required for better reaching the audience. The two other “incarnations” turn out possible due to the text complexity. 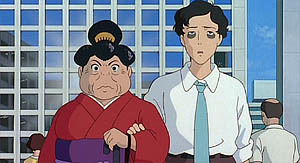 The film does not create an alternative past, but is based on fact (the urban development in Tokyo’s suburbia). 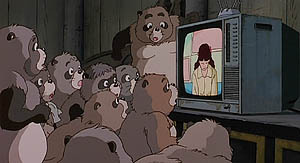 The sheer need to tell a little animal adventure story would reduce Pom Poko to the usual children-friendly 70 minutes. 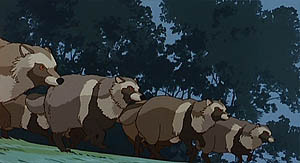 The complexity, the epic tone — strengthened by a narrator situating the timeframe, referring to years in the “Pom Poko Era” (4) —, but also the need to allow for light moments of genuine wit (the tanuki like to have fun), make it possible for a two hour film not intended to be harmless; in war there are casualties on both sides. Foxes also share the gift of metamorphosis, which allows them to live among humans. 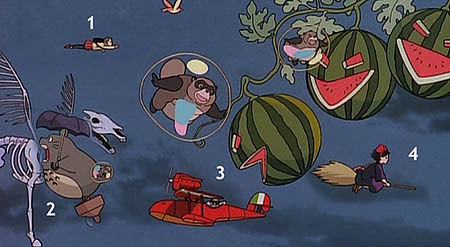 The "ostentatious" drawing of the creatures' anatomy is another factor that may induce some parents to doubt if the film is appropriate for small children. We are not quite used to see, in a family film, animated drawings with pending testicles and even less its relevant usage in a war context, showing an enormous flexibility during transmutations. Quite surprisingly, Disney released the film (classified as PG). The fact that it is the complete version doesn't surprise us, because that was fortunately included in the distribution contract. We cannot stress too much that the excellence and maturity of the Ghibli films, whether they are more or less suitable for children, makes them more desirable for the adult moviegoers than for their offspring’s entertainment, although that does not hinder that many of these films succeed in fact to delight both children and adults. (1) For simplicity’s sake, during translation, the animals are referred to usually as raccoons. The species name is nyctereutes procyonoides viverrinus. (2) Theses issues have already been largely referred to in other commentaries to the Ghibli work. (3) The fact that Japanese film makers and Japanese people in general regard animation very seriously is reflected by Japan presenting Pom Poko as a candidate to the Oscar for Best Foreign Film at the 1995 Academy Awards. The film was also no.1 in the local box office during 1994. (4) The counting of the years in Japan is also measured, alongside with the Gregorian calendar, by eras delimited according to the emperors' reigns. Thus, the actual era, Heisei — referred to in the film's original title —, began in 1989 (2005 being the 17th year of the Heisei Era), which followed the Showa Era (1926-1989). The Showa Era corresponds to Hirohito’s time and the Heisei Era is that of the actual emperor Akihito. Such as in live action cinema, the world of animation also appreciates some cameos now and again. 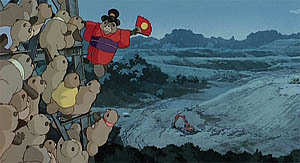 In the film’s sequence where the tanuki start their "haunting war", they assume the form of, not only ghosts of Japanese mythology, but also that of some flying characters of other Studio Ghibli films. 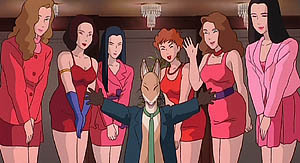 Viewed in the Ghibli collection released in Hong Kong by IVL (R3). Also available in other countries, such as the USA. Contents should not vary much throughout the several editions. The IVL edition includes the usual two discs, the only substantial extra being the complete storyboard, which may be seen alternating with the film (multiangle).